This is our latest cake, designed and built for the National Wedding Show at Manchester Central in October. Easily feeding a wedding party of around 150 guests this is a great choice as there is something for everybody to enjoy! Seven wonderful cheeses contained within! Base Layer – Rutland Red Leicester, a rich farmhouse Red Leicester, full of flavour and gorgeaous to look at! 10-11 kilos of cheese overall. 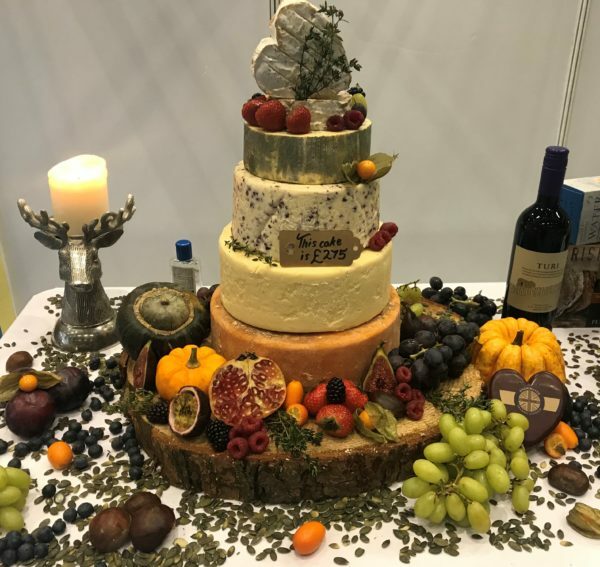 As with all our cakes, all of the fruit, seeds and herbs necessary to dress the cake are included in the price as is delivery. You may want to consider adding in biscuits and/or chutney onto your order – this is something we can help you with (just ask us for a quote) or we are quite happy for you to provide your own.